I was very enamored when I saw photos of the Sailor Pro Gear Imperial Black floating around on Instagram. I cannot remember who was the one who started the craze which promptly swept through the Pen Addict Slack room. Person after person post their own Imperial black pen. I was so tempted and I finally caved. I got my own from Rakuten Global as a birthday present for myself. I consoled myself I was buying it at a bargain since the Japanese yen was so low. 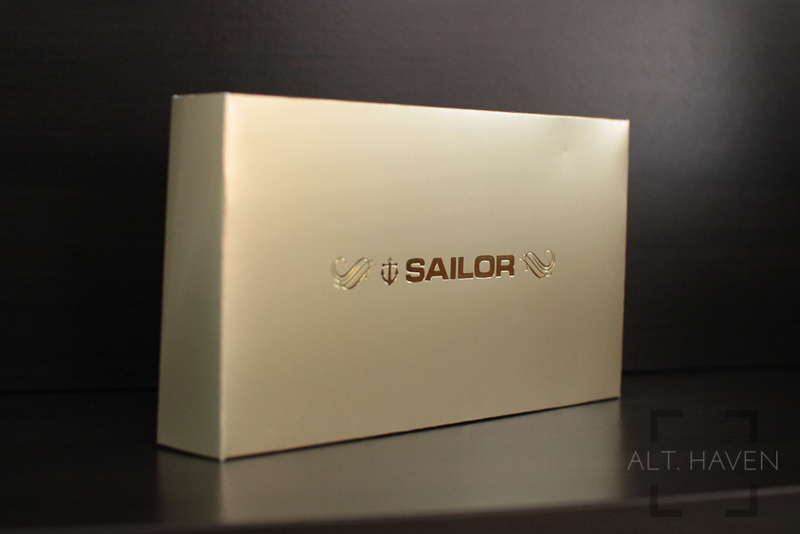 The Sailor Pro Gear Imperial Black came in a rectangular box together with a gold outer cardboard box. Once I removed the cardboard box, I find a brown felt covered box which I thought looked rather gaudy. Be that as it may, the box isn’t the important thing. The box is rather large considering that the pen isn’t all that big. Inside, I found the pen nestled on a satin-like bed. It came with 2 cartridges as well as the manual, warranty card and the like. I was disappointed to find that a converter wasn’t included with the pen. Considering how much this pen cost, I would have expected them to throw in a converter at the very least. So far this has been the case when buying from places such as Amazon Japan and Rakuten. 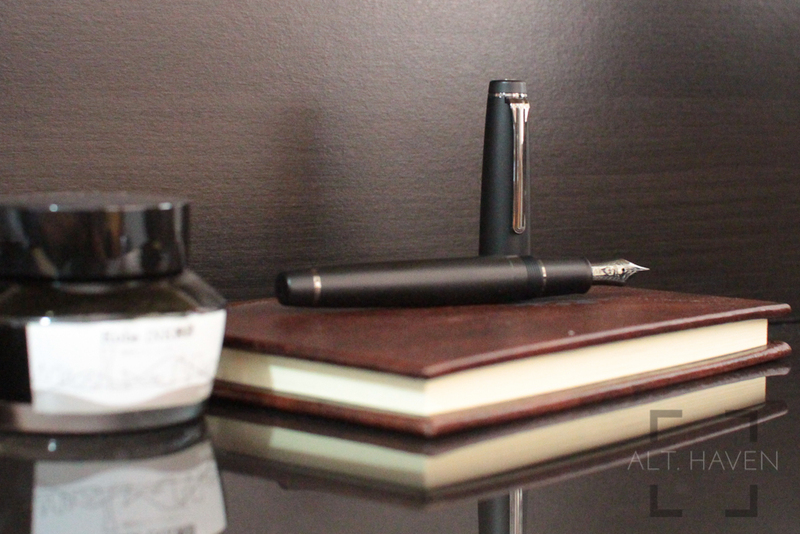 The Sailor Pro Gear Imperial Black is a flat ended fountain pen. 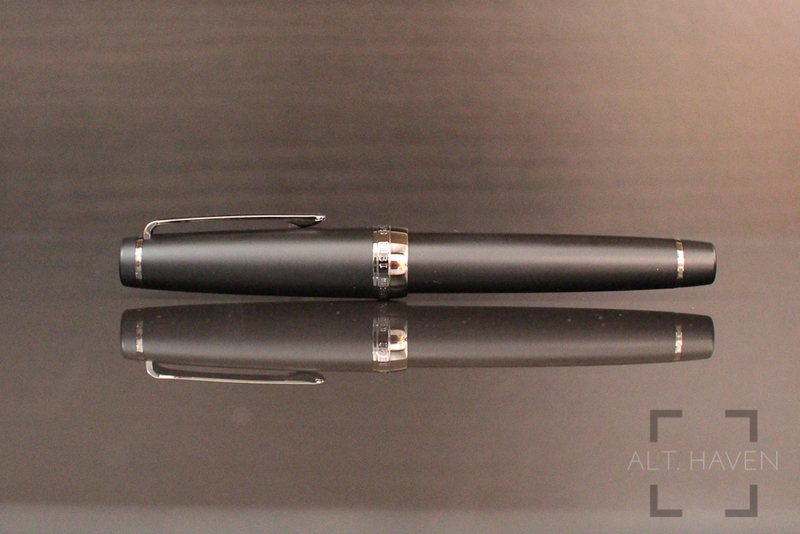 The smooth matte black finish of the pen is nicely complemented with smokey titanium ion plated trim, to match the entire look of this pen, even the nib has the same treatment. This is one stealthy fountain pen. The finial of the cap sports the anchor logo of Sailor. The clip is a simple metal one. It is fairly firm and stiff. Looking at the clip straight on reminds me of the Pelikan’s pelican beak clip. It is similar but not identical. 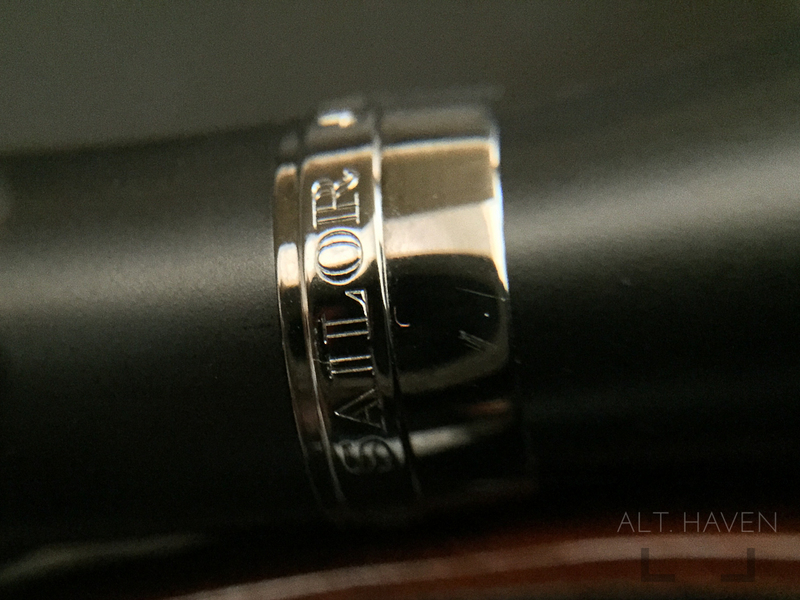 The centre band has the words “Sailor Japan Founded 1911” engraved across it. The cap twists open smoothly in 2 revolutions. The grip section is made of the same material as the barrel. There is almost no step between the barrel and the grip section. 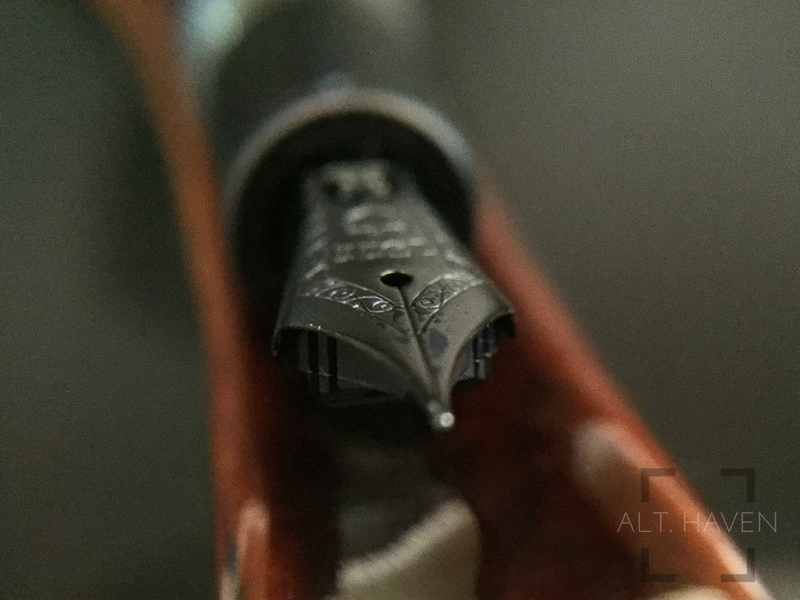 It is very comfortable to hold the pen, the threads on the barrel are smooth. 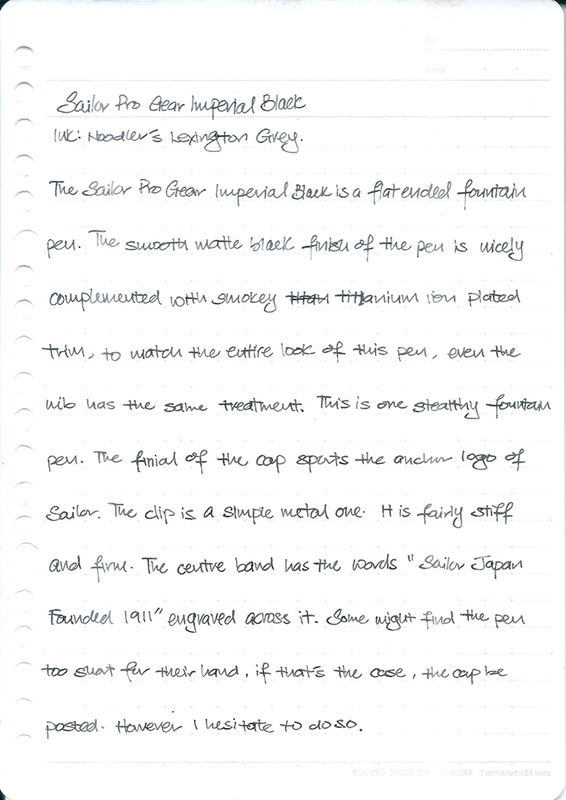 The Sailor Pro Gear Imperial Black is well balanced when unposted. The pen itself isn’t very heavy so if you enjoy pens with heft, this might not be for you. Some might find the pen too short for their hand, if that’s the case, the cap can be posted. However I hesitate to do so, I am quite sure by posting the cap, there will eventually be marks on the barrel. The barrel unscrews to reveal the converter. Sailor pens only take their proprietary cartridge and converter. The section has a metal collar, so this pen cannot be eyedropper-ed. My barrel squeaks when I unscrew it, I figure a little silicone grease should fix the problem. 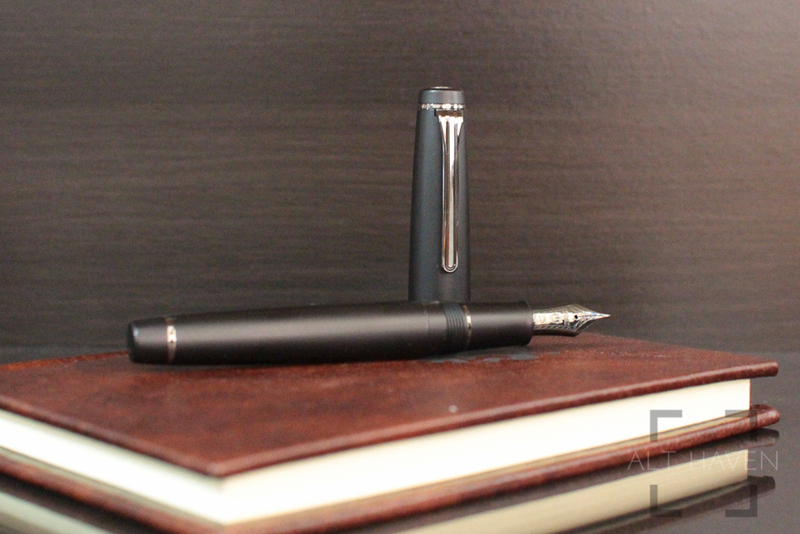 Now comes the star of this fountain pen, a black 21k gold nib that’s titainium ion plated. The Sailor Pro Gear Imperial Black comes in a variety of nib options. You can get it in F, M, B, and Z nibs. Z being Sailor’s zoom nib option. A zoom nib is kind of like a fude nib where the line width changes according to the angle of the nib to the paper. I opted to get mine in a fine nib. It lays down a very thin line. If you’ve purchased this pen thinking it can give you some sort of line variation, you’d be in for a rude awakening. Just because the nib is 21k doesn’t mean the nib is automatically softer. The nib is as stiff and unyielding as they come but this is well within my expectation. 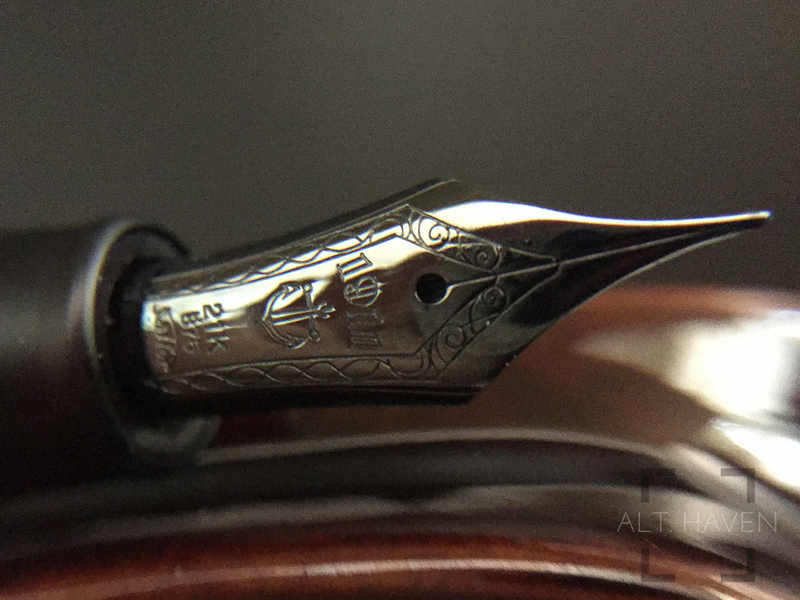 The 21k nib writes with a slight toothy-ness to it. It isn’t altogether unpleasant but this is something to note if you enjoy a smooth writing experience. I had initially didn’t like the feel but the toothy-ness grew on it. For the price of the pen, The Sailor Pro Gear Imperial Black is a rather standard cartridge converter style fountain pen. Its main selling point is the matte black on black design as well as the 21k gold nib. If neither speaks to you, there are plenty of flashier designs offered by Sailor or other pen manufacturers. However if you do enjoy the look of the pen, the Sailor Pro Gear Imperial Black is a beautiful specimen of this design. 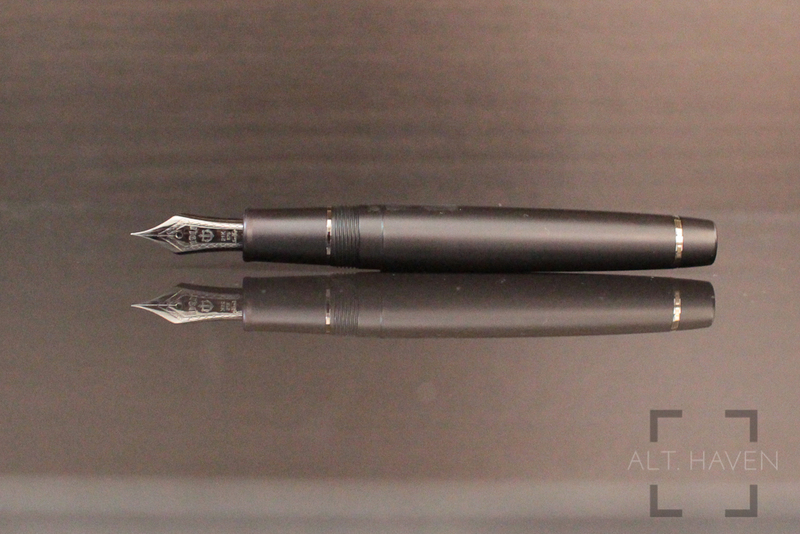 Others I can think of will be the Pilot Vanishing Point in matte black as well as the Omas Arte Italiana Noir Milord.